Like many Caribbean nations, Trinidad has felt the effects of globalization on its economy, politics, and expressive culture. Even Carnival, once a clandestine folk celebration, has been transformed into a major transnational festival. In Trinidad Carnival, Garth L. Green, Philip W. Scher, and an international group of scholars explore Carnival as a reflection of the nation and culture of Trinidad and Trinidadians worldwide. The nine essays cover topics such as women in Carnival, the politics and poetics of Carnival, Carnival and cultural memory, Carnival as a tourist enterprise, the steelband music of Carnival, Calypso music on the world stage, Carnival and rap, and Carnival as a global celebration. 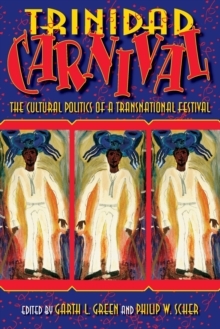 For readers interested in the history and current expression of Carnival, this volume offers a multidimensional and transnational view of Carnival as a representation of Trinidad and Caribbean culture everywhere. Contributors are Robin Balliger, Shannon Dudley, Pamela R.
Franco, Patricia A. de Freitas, Ray Funk, Garth L. Green, Donald R. Hill, Lyndon Phillip, Victoria Razak, and Philip W. Scher.